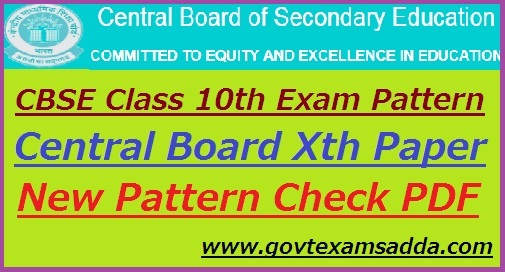 CBSE New Paper Pattern Check:- The Central Board of Secondary Education release the CBSE 10th New Exam Pattern 2020 for class 10th. Students who have admit in Standard 10th, They are check CBSE New Paper pattern 2020 Subject Wise also. So you can check the below details. According to Newspapers, CBSE is planning to make some changes in the examination pattern of 10th class from 2020 that would include changes in the examination scheduled for vocational subjects as well as for the main subjects. Hello Students, Are you finding CBSE New Exam Pattern 2020? then you are on right page. Our Team has provide the Subject Wise CBSE Paper Pattern 2020. Through the help of this CBSE 10th New Exam Pattern 2020, You can get good Score in the Final Examinations. It is not easy task, But it can be done by the hard work & patience. Students also search the CBSE 10th Class New Paper Pattern 2020 also. Below, This page, We have provide CBSE Marks Pattern for Class 10th also. CBSE is likely to offer an option for the candidates to select the level of question paper. From now a student may choose whether to answer a standard level or the existing-level question paper. This change has only been made for the CBSE Class 10th Mathematics paper. Since CBSE has not updated it on their website. So you can wait for the official declaration also. Why is CBSE introducing these changes for class 10, 12? MHRD sources, agencies reported that the initiative of this pattern change is being taken to discourage students from learning. The new pattern would test students on their analytical skills and reasoning abilities instead of blind copy pasting of textbook. The board has also claimed that this step will generate a better result and the academic quality of institutions will be renewed. Vocational course exams to be conduct in February, and the final board exams to conclude by March around 15 days as per a senior official. Following the early wrapping up of boards, the results are likely to be declared earlier than the schedule followed in the current structure. CBSE is planning to change the question paper pattern of Class X and XII exams from 2020. This comes as part of a revamp that also includes holding vocational subject tests earlier and declaration of results. CBSE new exam pattern would test students on their analytical abilities and reduce the scope of rote learning. CBSE has released the Class 10th Paper Pattern for the academic session of 2019-2020. you will get the complete Marking Scheme of CBSE Class 10th. After analyzing the Board Exams in Class 10th, The exam conducting board has also brought CBSE 10th New Exam Pattern 2020 and changes in the internal assessment (IA). CBSE Class 10 Mark System, Maximum Marks are 80 for each subject. Students need to secure 33% marks, which is passing marks in CBSE Class 10 out of 80 Marks in each subject. For Each Subject Grades will be given. Central Board of Secondary Education has asked all of its affiliated schools to reserve one hour for physical activity and outdoor games. Board has decided to allot marks for outdoor games & activities to each student as well. This one hour will be called Health Education and Physical & will come into effect in 2018 – 2019 academic session. It is compulsory for all the students to participate in exam. There will be practical based questions comprising weightage of 12 marks. 1 marks question must be answered in one sentence. 2 marks questions – about 30 words. 3 marks questions – about 50 words. 5 marks questions – about 70 words. Social Science is considered one of the most scoring subjects in 10th class. As per the CBSE Marks Pattern for Class 10th, the authority covers entire syllabus of Geography, History, Civics, and Economics in Social Science. The Social Science Marking Scheme of CBSE Class 10th is given in the below table. 3 marks questions – about 80 words. 5 marks questions – about 100 words. The exam pattern for CBSE Class 10th Board Exam has 4 sections, like A, B, C and D. CBSE Class 10th Main Exams has 80 marks for 30 questions. Internal Choice in sections where candidates have to attempt only one question. 4 questions of 3 marks, in section C.
3 questions of 4 marks, in section D.
CBSE Class 10th Marking Scheme for English Communicative is given below as per CBSE guidelines. This includes reading comprehension, wherein two unseen passages of 700 – 750 are given. The passage can be factual, literary, or discursive to test comprehension skills. This is the section the writing skills are examined. Letter writing, Notice writing, Poster making, Article writing etc. are asked in B section. This section also meant to test your skills in grammar like tenses, modals etc. This section is based on literature and poems from the book “First Flight”. Questions are asked from the Literature Textbook and Extended Reading Text. This subject improves the computer literacy of the students. Here is the updated CBSE Paper Pattern of Class X. This Subject “Foundation of Information Technology” provides student advanced knowledge about Internet, Computers and its Applications after studying its basics in Class 9th. After studying Foundation of IT in Class 9th, The advanced knowledge about Internet, Computers and its applications is given in Class X. Physical Education is one of the most opted elective subjects by the students. Check below the complete Paper Pattern of Class 10th Physical Education in the same format as released by CBSE. Question 1-11 carries 1 mark – about 20- 30 words. Question 12-19 carries 3 marks – about 80 -100 words. Yet the Central Board has submitted this proposal to the ministry for approval. However, the board is already working toward implementing the changes in question paper by the year 2020. If you have any query or suggestion regarding CBSE 10th New Exam Pattern 2020 then they comment to us.